Overlooks the Spelga Dam and the Deer's Meadow, the source of the River Bann. It is surprising to think that this river rises less than 10 miles from the coast near Newcastle, and yet it empties into the sea near Coleraine. 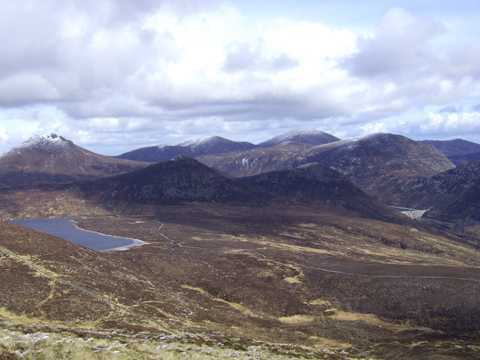 Slieve Muck is the 160th highest place in Ireland. Park at J27115 25243 A, an access road to Spelga Reservoir, room for 5-6 cars on the roadside without blocking the road way. 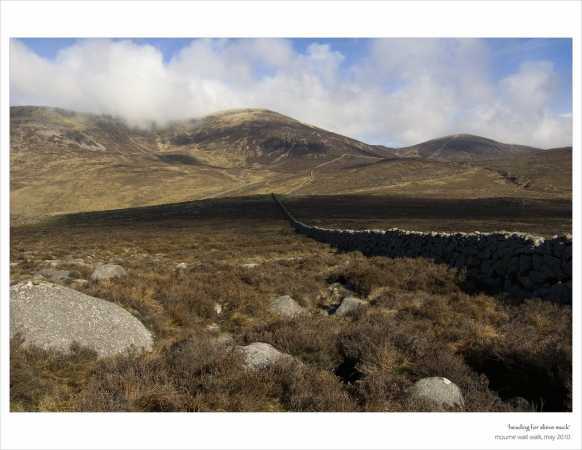 Cross the public road and over the wall on the far side heading generally east then follow the stone wall uphill until it meets the main Mourne wall crossing near the summit area. Muck and myself have a history. Our first encounter came as part of a very enjoyable circuit of Spelga Dam, following Batts Wall to it's meeting point with the Mourne Wall. We had got on well that day, event taking some time to enjoy the views of the high Mournes and Spelga Dam. Our second encounter came at the end of an ultimately doomed 2-day stint at walking the Mourne Wall, the day starting out in baking sunshine but ending up in a heavy mist stirred around Muck's slopes by a storm-force wind. Muck wasn't in a good mood and it was taking it out on us! Climbing muck as evening turned into night on that occassion, we had literally hit the wall... totally 'blown-up', our stuffed packs pulling us back one step for every two steps we took forward. At one stage, we even considered the possibility of pitching tents on a rock on the side of a relentlessly steep section of ground that just kept coming. 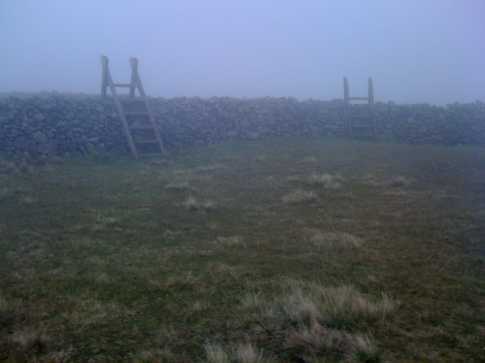 Picture from wicklore : The stiles near the summit of Slieve Muck provide entertainment on a cloudy day. Picture: The stiles near the summit of Slieve Muck provide entertainment on a cloudy day.